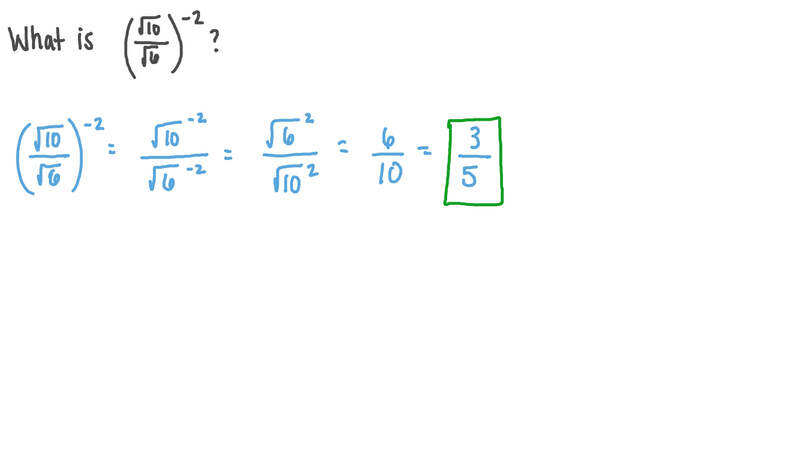 In this lesson, we will learn how to convert a radical expression to its equivalent exponential form and simplify it. 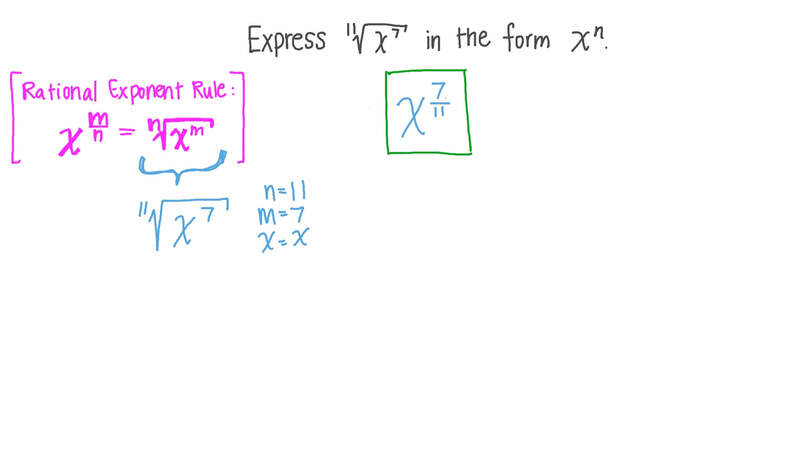 Express 1 1 √ 𝑥 7 in the form 𝑥 𝑛 . What is  √ 1 0 √ 6  − 2 ? What is one-eighth of  √ 8  7 1 4 ? Find the value of 5   1 − √ 6  5 . 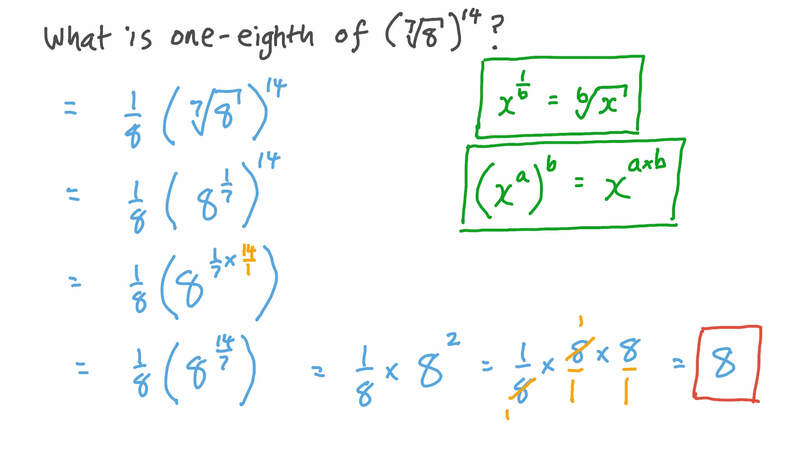 Which of the following is equal to 1 6 √ 𝑥 3 ? Which of the following is equivalent to 3 √ 1 2 5 ? Which of the following denotes the 𝑛 t h root of 𝑎 ? Write  √ 𝑥   in the form 𝑎   . Simplify 5 +  √ 5  +  √ 5  +  √ 5  +  √ 5  7 1 4 1 4 1 4 1 4 . Given that 𝑎 = √ 5 and 𝑏 = √ 2 , find the value of 𝑏 − 𝑎 𝑏 + 𝑎 4 4 2 2 . Which of the following is equal to  − √ 2 2  − 2 ? What is the value of 4 +  − 1 √ 4  + 1 √ − 6 4 0 2 3 ? Which of the following is equal to 5 +  √ 5  − 5 ( 5 ) 6 1 2 6 ? Which of the following is equivalent to 3 √ 2 7 2 ? Express 𝑥 √ 𝑥 5 2 3 2 4 in the form 𝑥 𝑛 . What is  √ 7 √ 1 4  − 4 ? Find the value of 3 6   2 9 − √ 3  3 6 . Which of the following is not equal to 1 3 √ 𝑥 5 ?